Box tops must be submitted by October 26th to be included in the classroom competition. Did you know that you can earn funds for Stillmeadow by clipping Box Tops from items you buy every day? 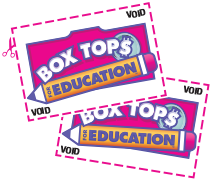 The Box Tops for Education Classroom Challenge is October 15-26. Submit your Box Tops using a collection sheet and send extra Box Tops in a plastic baggie. Be sure to include your child’s name and teacher’s name on all sheets and/or baggies in order to receive credit towards the competition. The classroom from each grade that turns in the most Box Tops during this period will win a special prize! Contact MaryBeth Woods with questions.